I grew up with war stories. World Wars I and II on the German side and my Dad’s service in Korea and Vietnam are all part of my family’s story. Occasionally I will share a story here. We don’t know much about Rudy Gentzheimer beyond his name. And that he was one of the millions of casualties of World War I. We don’t know what his hopes, dreams, and aspirations were. We don’t know where or when he died. One thing we do know. Frieda Gierich loved him with a ferocity that survived two World Wars and two husbands. It’s hard for me to grasp the reality of millions of dead young men in a war which nearly erased a generation from the face of the earth. Somehow the tragedy of it is more comprehensible when I think of it in terms of just one life, my grandmother’s, knowing that variations on her story were repeated relentlessly throughout Europe and eventually the United States. I have a vivid memory of the day she showed me the sepia-toned photograph of Rudy Gentzheimer and told me he was the man she had wanted to marry. He was handsome in his uniform, prematurely balding, blonde, and well-built. That’s it. That’s all we know about this phantom who had such a place in my Oma’s heart. How I yearn to be able to ask her about him now. After the war there was a shortage of eligible young men to marry in Germany. A middle-aged civil servant wanted to marry Frieda, but she refused. Family lore has it that her father struck her and told her she would, indeed, marry this man like it or not. Money was hard to come by, and she was not welcome in the home if she didn’t obey. She married a man she did not love. In the 1920s, after giving birth to a little girl, she divorced Herr Markowitz – a highly scandalous (and brave) act in that day especially for a young German girl. She went to work in a resort hotel in charge of linens and there she stayed for several years. I think of her working very hard, managing the life of a single mother in a time that couldn’t have made it easy to do so. And always, I imagine, grieving for Rudy Gentzheimer. One of those young men was my grandfather, Fritz Martin. 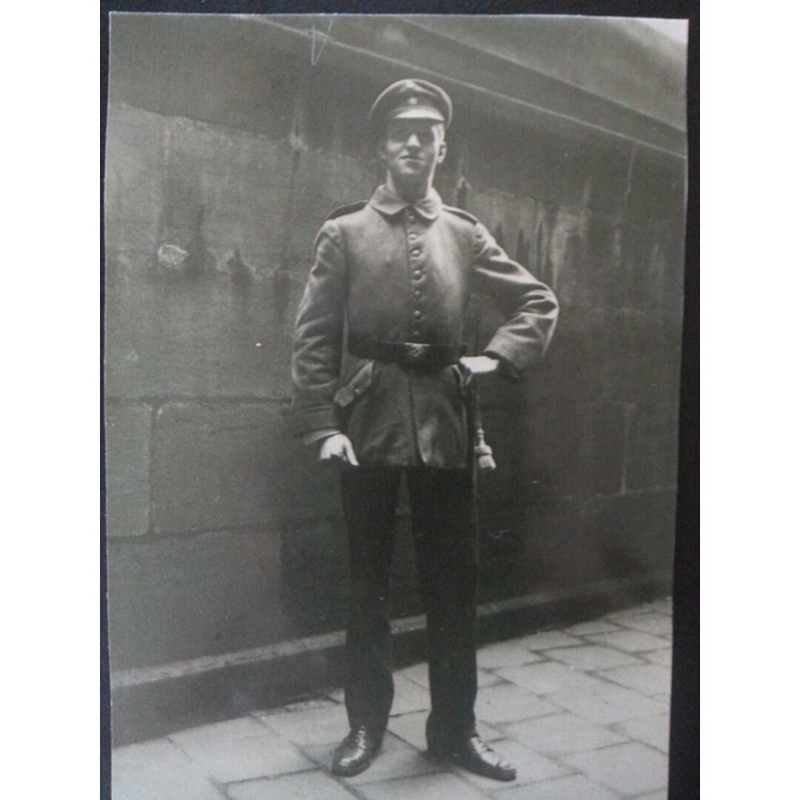 He had served in the war in the Royal Bavarian Army and had been gravely wounded in France in 1915. He spent a year in a convalescent hospital and was relieved from active duty. When he met Frieda he was beginning his career as an automobile industry engineer. One of the lucky ones. 200,000 young men from the Royal Bavarian Army were killed during WWI. Obviously, Frieda didn’t stay counting bed sheets the rest of her life or I wouldn’t be here telling their story. 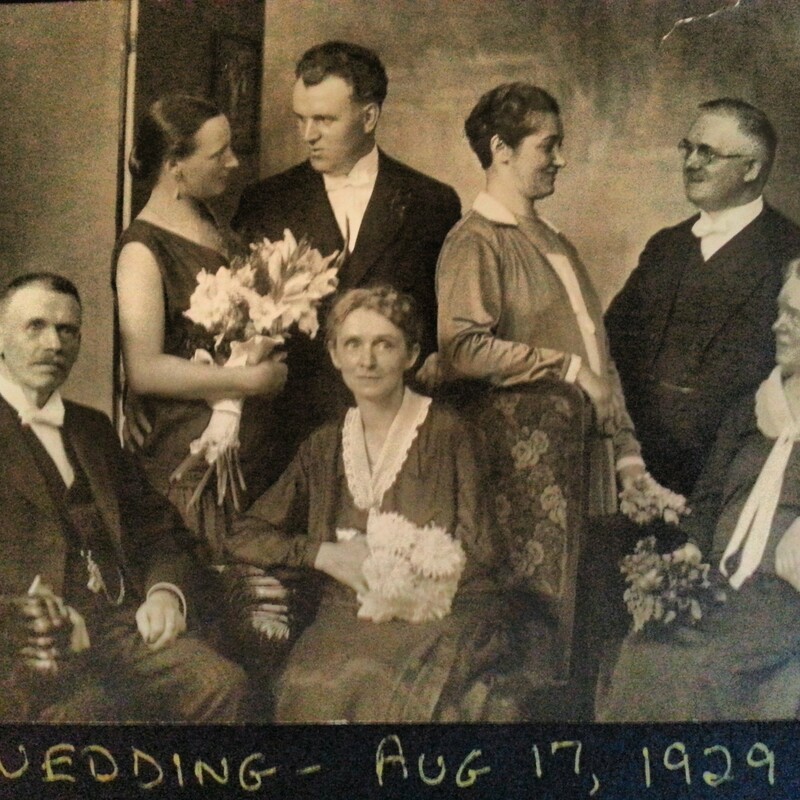 Frieda and Fritz were married in 1929 and six years later my mother was born. Frieda and Fritz are in the upper left. The others are all members of his family. At least they had a few years of peace before the next conflagration began. When my grandmother showed me the photo of Rudy Gentzheimer, it was in the 1960s. Now that I think about it, I realize that the photograph somehow made it through the devastation of World War II. Did she carry it with her through the bombings and the harrowing flight into the Austrian Alps after the war? I imagine she must have. We don’t have the photo now. When Oma died, we were living in the US, and her possessions were handed down to other German family members. I wonder if it was thrown away. No matter now, I guess. I’ve asked my mother what she knows about Rudy Gentzheimer. She feels as I do – frustrated that there are questions to which we will never have answers. My mother’s sense is that Frieda never really recovered from his death and that the grief was with her for the rest of her life. And while I am fully aware that Rudy’s death paved the way for my own life, I feel a sort of sorrow for his life cut short far too soon and for my grandmother’s great loss. They say that no man is really dead while his name is still spoken, and so for Rudy Gentzheimer and all the rest of the boys who marched off to the old Lie, I remember his name one more time. Life in a 1915 farmhouse in Central Virginia. And the odd thought or two. Quote | This entry was posted in Random Ruminations and tagged Dulce et Decorum, Germany, Oma, Opa, vintage photos, war, Wilfred Owen, World War I. Bookmark the permalink. Beautifully written, and fine sentiments Barbara. It was indeed ‘the old lie’. I was pleased to see that my step-grandchildren (such an unwieldy word) had lit a candle last weekend for all the ‘lost souls’ as they called them. I’d once repeated the old adage to my stepdaughter that ‘those who don’t remember the past are condemned to repeat it’ and it seems to have stuck with her. It warms my heart to hear of younger people remembering the “lost souls.” Such a terrible waste. I so appreciate your very kind comment, Sandra. Wouldn’t it be wonderful to close the loop regarding the where’s and when’s of Rudy’s passing? Imagine, it’s possible that someone might scan the photo to a genealogy site. I suppose that’s the fairy tale ending, yes? Maggie, I went on a German WWI commemoration site to see if there are records for the war dead. Can’t quite figure out how to wallow through it all yet but knowing the Germans and their meticulous penchant for record-keeping, I imagine there is a record somewhere. Yes, closing the loop would be wonderful. Try this site. If Rudy Gentzheimer is buried in a war grave they will know. Thank you, I will try it. Much appreciated. What an awesome tribute to all the brave and courageous warrior souls who are lost to us. I had never heard the saying “no man is really dead while his name is still spoken” and I will remember that. The haunting verse you included about World War I says it all about that gruesome time, doomed to be repeated if we do not remember. 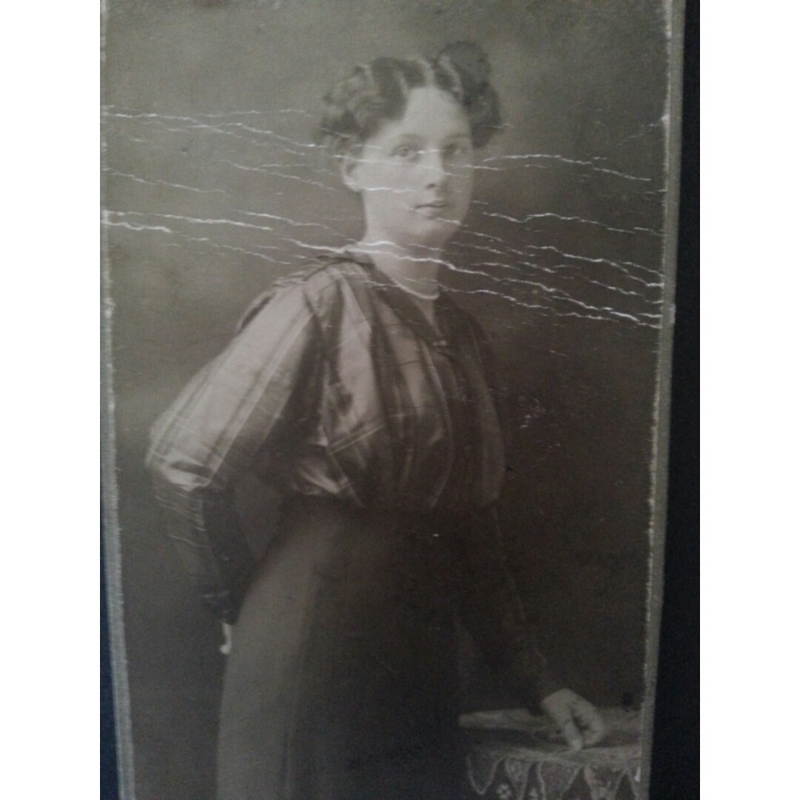 Your grandmother was so very beautiful and her story of love and loss touches my heart. Wilfred Owen, the great WWI poet, died in the war also. The poets of that war leave us an unimaginably vivid record of the horrors of war. The fact he capitalized the word “Lie” in his poem gives it even more emphasis, doesn’t it? Thank you for reading and commenting, Dor, I’m so pleased you related to this. Your story really touched me. I think every family have such forgotten stories and characters who made us the people we are today. I often wonder about all the untold stories out there. Keep telling them please. Every family does have their forgotten stories, I agree. And I feel time nipping at my heels with the stories of my German grandparents. I am the last generation to have known them and so feel a certain duty to record their stories. Thank you so much! So eloquent and poignant, Barbara. Maybe someone who knew Rudy will find this post, and you will learn more about your Oma’s great love. 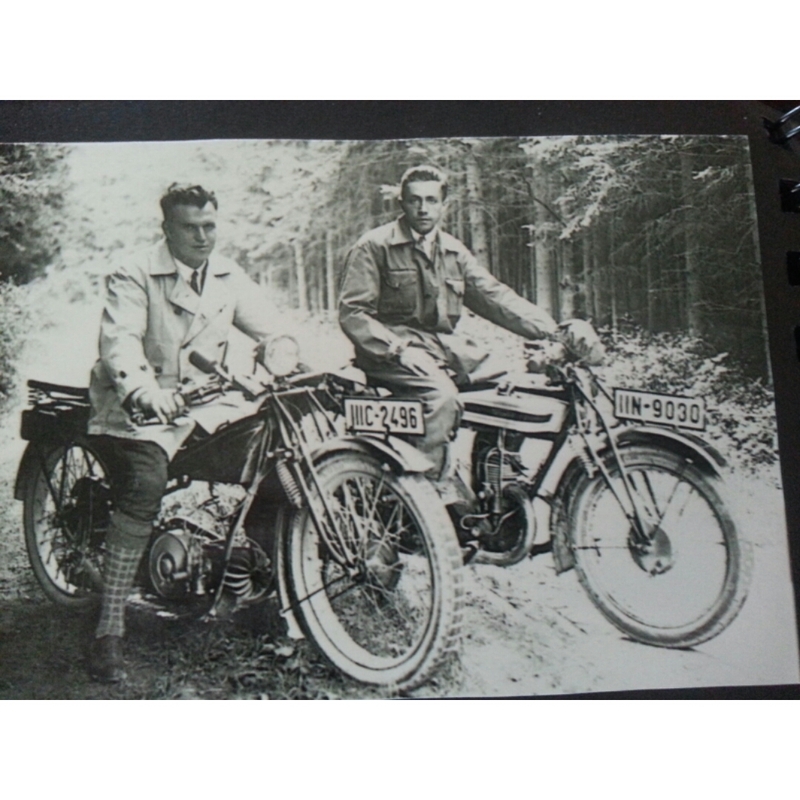 I LOVE the motorcycle picture of your Grandpa (Opa? 🙂 ). Do you think she loved him? What an admirable woman Frieda was – especially for her day! Loved your post. My mother and I have discussed this very question and we think that she loved Opa very much. He was a good man and devoted to her. He was never the great love of her life – that died on the battlefield. Thanks so much for reading and commenting, Jodi. Beautiful post, Barbara. Our lives are full of twists and turns ~ some happy, others sad. Sounds like your Oma believed she’d lost her one true love in the war. On the bright side, you’re here! Yay for that. Is the framed photo in your header also your Oma? Yes, Nancy, that was her a few years before the outbreak of the war. There is a photo of both Oma and Opa in “Proustian Pretzel” taken in the sixties. You may find that one interesting too. Yes, I’m kind of grateful for that myself! The fact any of us is even on the planet in our current form is sort of a magnificently arbitrary miracle. Thanks for reading, Nancy. You always bring a bright side. What a beautiful post….and if your grandmother had not been able to love your grandfather i’m sure that, strong woman as she was, she would not have married him. I wonder if publishing this will bring news of her first love, Rudy Gentzheimer? Hello Helen! Well, look what I just found in my spam folder! Dashed WordPress at it again. Anyway, that is not the point. 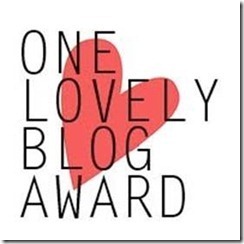 I thank you – albeit a bit tardily, for reading and commenting on this post. I sort of hold a vague hope that somewhere, somehow a connection might be made with RG’s family. Stranger things have happened, we all know. Sad, but beautiful story. It almost made me cry. I can relate to your grandmothers need to move on with her life and thank God, she did. The secret to peace of mind is how well you deal with Plan B a very wise woman once told me. Oh wait, that was you. All around us are Plans B in action, I think. What a beautifully told story. Makes you think about other girls who have lost the love of their life either in war or some tragedy and had to move on with their lives. You had such an interesting life and we love that you share it with us. Such lovely pictures too. I think of all the wasted potential, Dorothy. The cure for cancer could have died in those battlefields or the Great American Novel…. It is true: it is the speaking of the name that keeps them with us, Barbara. Oh M-R, I know you know this better than most. I am so looking forward to reading about Chic. Thank you for your comment. Your poor grandmother! Particularly being made to marry Herr Markowitz while she still mourned for Rudy. I’m surprised she managed to keep her daughter. So often back then fathers more or less owned their children by right. Did your mother know her half sister? Wilfred is one of my favourite poets. He and WW Gibson, also a war poet. I would like to read WW Gibson – not familiar at all. Is there a particular poem that is a favorite of yours? Some of it doesn’t appeal to me at all, but this one always has. Remarkable, Helen. So many layers in this poem. Heartbreaking combination of the everyday and the horrific. Betting on soccer while flat on one’s back in the trenches….an indelible image. Thank you so much for sharing this. I will be reading more of Mr. Gibson. Thanks. Found this poignant. I was reminded of the irish poet Brendan Kennelly in a marvellous collection called The Man Made of Rain who said something like .. It is not the dead who forget us but we who forget the dead … Good to see you not doing so here. Hello Thom. Oh, so many poets to explore. Yes, the quote you provide pretty much sums up my motivations behind occasionally telling one of these war stories. I appreciate your comment very much. Hello Barbara, You are lucky to have this family background and these stories. So many who lived through that era (including my own grandparents) were reluctant to talk about it, leaving hints and fragments that no longer can be reconstructed or understood. Jim, I’m realizing that I’ve taken this rich family history very much for granted. So many have told me they know nothing of their grandparents’ lives, and I have this treasure trove of knowledge. I cherish it even more now and am grateful for all those stories around the dinner table. Oh Anne, I am so happy you liked this. Wilfred Owen, WWI, the 100th commemoration, all just a blip on our television coverage in the US. Barely mentioned. I know you’ve been traveling like mad lately. Hope you’re having fun and baking fabulous things! Yes, am back in guernsey – the dog is wondering who we are! Keep those wonderful posts coming. Thank you, Elizabeth, glad you enjoyed. No, I didn’t find your email – my fault, I’ve been lax in checking gmail lately. I’ll pop over now! What a deep story! Thank you ever so much for sharing this post. Your grandmother Frieda was indeed a strong woman. Thank you, Joslyn, and how nice to see you over here! Welcome! Yes, my grandmother was an amazingly strong and resourceful woman. She was tested in ways that most of us modern women never have to face. Thanks for reading!! What a beautifully written story! It is so important for us to remember and document these memories. I am always humbled when I think about the suffering, and extreme “uncertainty of life”, that our not-so-distant ancestors experienced. Our trials and tribulations are so trivial in comparison. The Old Lie indeed. The war that no one – and yet everyone – seemed to want. The war that was assumed would be over in a couple of weeks and yet it unleashed a horror and tragedy that has extended a century later. I couldn’t agree more with every word you’ve written here, Joanne. We are so incredibly spoiled and what troubles me is that so many of us don’t seem to know it. We take it all for granted and that is very dangerous indeed. Have you seen the red poppies at the Tower of London? Oh my, a gut-wrenching display. And truly, Joanne, speaking of uncertainty of life. I was never prouder of being a neighbor to Canada than in the exemplary and dignified behavior of your nation at the recent Ottawa shooting. Thanks Barbara. As a nation, I think it’s safe to say we were all pretty rattled. This could have been so much worse. For me the proudest moment was the next day when they returned to Parliament and the Prime Minister hugged the other 2 federal party leaders. Considering the acrimony that normally exists between them, I think that action spoke volumes. Interesting this love story of your Oma. Her love was so strong that even your generation is affected. What does the bible say about seven generations? The tragedy of war hits us only when we know something about the people involved. I’ve often felt the concept of millions of dead is just too much to really grasp. But one dead soldier, be he grandfather or first true love is another matter entirely. Thank you for reading. Here in America, even when you and I were growing up, people made rude remarks and assumptions about divorced women related to their being “loose with their favors”. My best friend here is Bavarian. Her mother divorced her father when my friend was young. According to her, in Germany, a divorced woman during this same time period was, by many, often seen as not someone to socialize with, not someone’s whose home you would allow your children to visit to play with her children. Your grandmother was truly a brave woman. And both your grandparents were remarkable: Your grandfather, for being wiling to marry a divorcee, and your grandmother, for attracting him to the degree that made him willing. I do not assume she loved him right away. People then–women, especially–did not always expect to do so. But that wedding photo where they’re already smiling, privately, as they make asides to each other, makes me confident they had some happy times. Re: the war–I have always loved that Wilfred Owen poem (that sounds so wrong–to “love” a poem such as that). I was very fortunate to be taught a course in that war by the once-president of USC, and it was a fantastic experience (my Aspie focus was then on WWI). When I was young, we used to make and hand out and war paper poppies. I don’t know when the kings in charge of America decided these reminders weren’t important any longer. That war, OB, that war which has been brushed under the rug and largelyforgotten at least in the US. I guess enough young men weren’t slaughtered for us to remember it the way we do other more glamorous wars. I love the poem too. The Wilfred Owen poem touches me deeply especially knowing his demise. There are other poets from that time that move me as well, Siegfried Sassoon being one and Rupert Brooks. The old Lie indeed. My grandfather, young and handsome, didn’t have to marry a divorcee with a child. One can only assume he loved her madly. Not sure about the way around but they sure look in love in that wedding photo, don’t they. They were wonderful grandparents. Wonderful post Barbara. Not least because it includes Dulce et Decorum Est which I too have quoted on my blog. I tend to use Armistice Day as an excuse (does one need an excuse?) to post his poems. I have an excellent book of WW1 poetry, must write about it. Your family history is fascinating. There was always something anout your striking open face that had me puzzled, and it’s obv your German ancestry. I’ve never heard of the Gibson poet, so I’ll be looking him up too. That means so much to me, Kate. Dulce et Decorum Est should be required reading by anybody contemplating war, but we know it would be lost on them, don’t we? The big Lie. Thanks again. I forgot to say how beautiful your photos and Frieda are. I studied Owen in sixth form at school for A-level, so at one point I was walking round reciting his poetry so I could use his lines in our exam. In those days we had to work for our exams (puts on grumpy old person hat), but dulce et decorum est pro patria mori never left me. Prob helped that I’d studied latin. I am a big fan of family stories and histories. I am always amazed that so many of them have quirks, uniqueness and never, ever boring stories. This was a lovely story abut your precious and beautiful mother and grandmother. I love her nickname, “Oma” and glad she found her “Opa.” First loves, tragic losses, can make some people’s lives hopeless, but this story is full of hope and generations of children following the death of Frieda’s first love.Thanks, Barb, hope you don’t mind my reading late. Better late than never, I hope! Smiles.